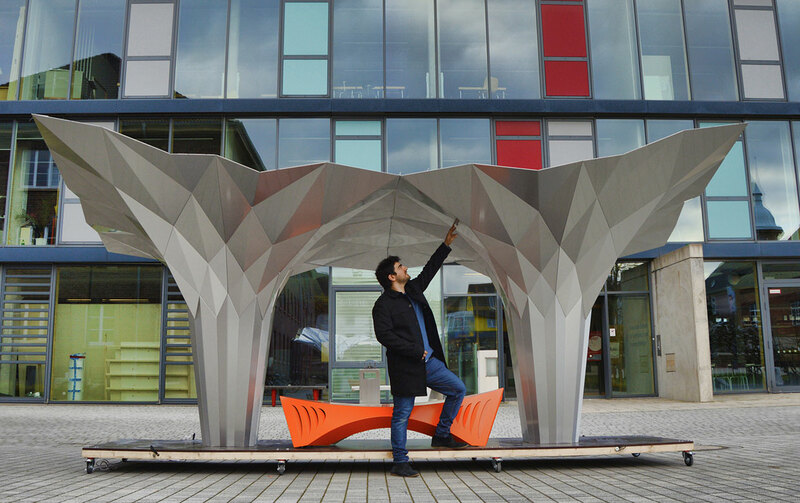 In the latest creation by Tal Friedman, the architect furthers explores parametric design with the ‘fold finding’ pavilion. Surrounded by classical German vernacular architecture, the modern pavilion towers over passersby with a unique canopy. The self-supporting structure encompasses several Japanese traditions. 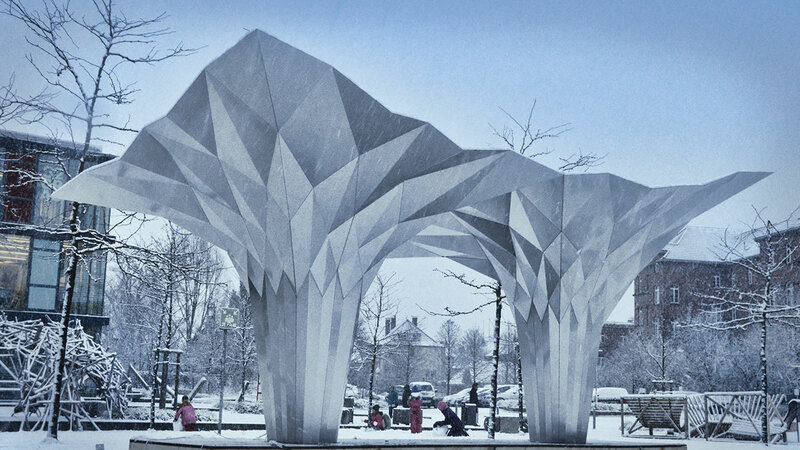 In both its structural composition, inspired by paper origami, and its substance, inspired by the traditional gated structure, the Japanese Torii. The folded work, as explained by Friedman, was initially created with paper models to better understand “the nature of folds.” The designers then gradually increased the material width in order to model the composite material used in the final design. 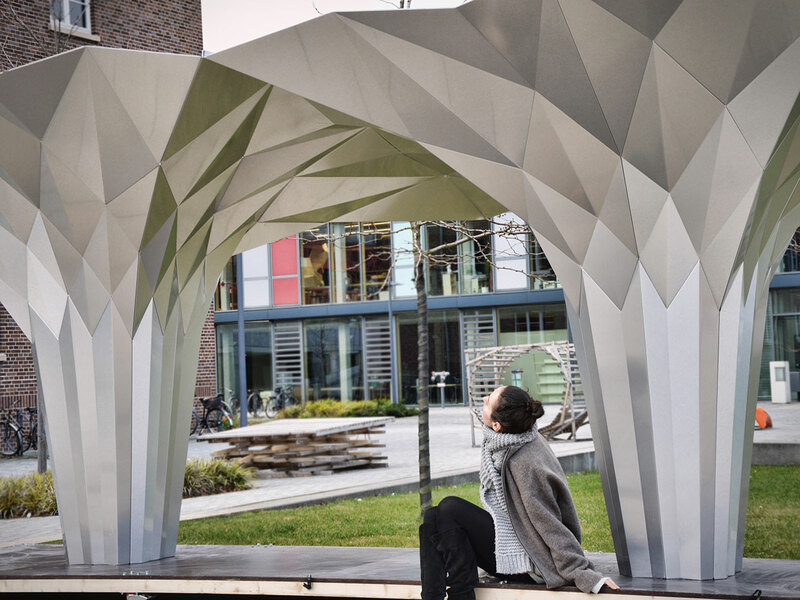 Alucobond’s aluminum composite was chosen for its lightweight, malleability and rigidity, with half the weight of traditional aluminum but increased strength with its polythylene core. Utilizing eight 4mm thick Alucobond panels, Friedman devised a system of folding that allowed the structure to be stabilized with no supportive structural elements. Friedman explains, “Each ‘flower’ is made of four unique sections which are folded into position. Each folded piece contains around 12-20 interconnected surfaces. This technique saves fabrication time and building tolerance.” Friedman often pushes the boundaries of his specified materials, testing their limits to achieve maximum value.